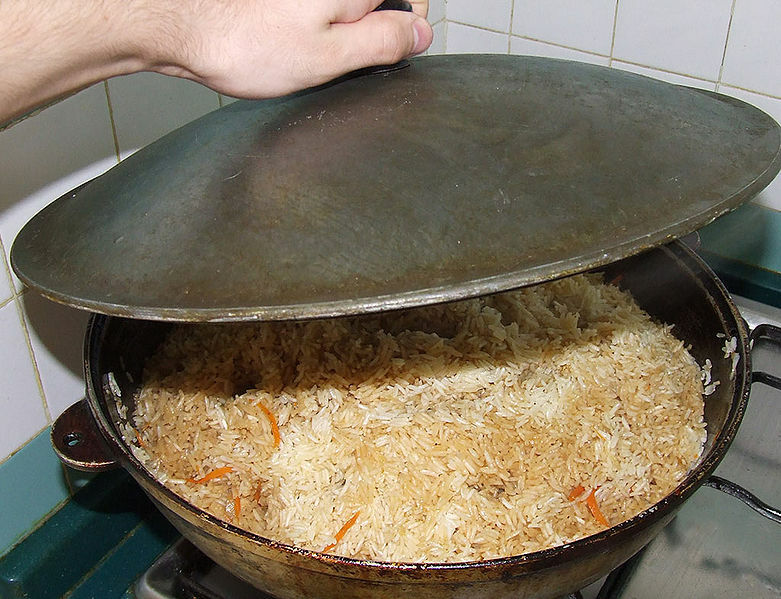 Pilaf, also called polo, polao, pilau, pilav, pilaff, plov or pulao in their adopted languages (Persian, Azerbaijani, Kazakh, Kyrgyz, Turkish, Uzbek, Turkmen, Urdu, Hindi, Pashto, etc. ), is a dish in which a grain, such as rice or cracked wheat, is browned in oil, and then cooked in a seasoned broth. Depending on the local cuisine, it may also contain a variety of meat and vegetables. Pilaf and similar dishes are common to Middle Eastern, Central and South Asian, East African, Latin American, and Caribbean cuisines. It is believed that proper preparation of pilaf was first documented by the tenth century scholar Abu Ali Ibn Sina (Avicenna), who in his books on medical sciences dedicated a whole section to preparing various meals, including several types of pilaf. Left: Plov being prepared in a qozon (a type of large cooking pot used throughout Central Asia). With Uzbek plov preparation, rice is simmered in a rich stew of meat and vegetables called zirvak until all liquid is absorbed into the rice. Plov is commonly prepared with lamb or mutton, browned in lamb fat or vegetable oil, and then stewed for several hours with fried onions and carrots, although beef could be substituted in a pinch. 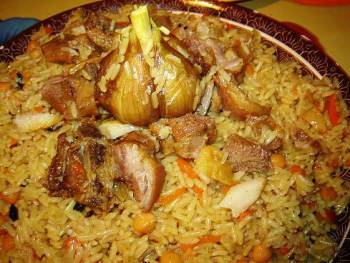 Chicken plov is rare and usage of pork is discouraged. It is usually spiced with cumin, coriander, barberries and garlic, with the whole bulbs buried in rice during cooking, although sweet variations, with dried apricots and raisins aren't unheard of. Uzbek plov became a very popular dish in the Soviet Union, and countless variations abound in the whole post-Soviet space. It became a favorite in such diverse places as Russia, Ukraine, and Georgia. 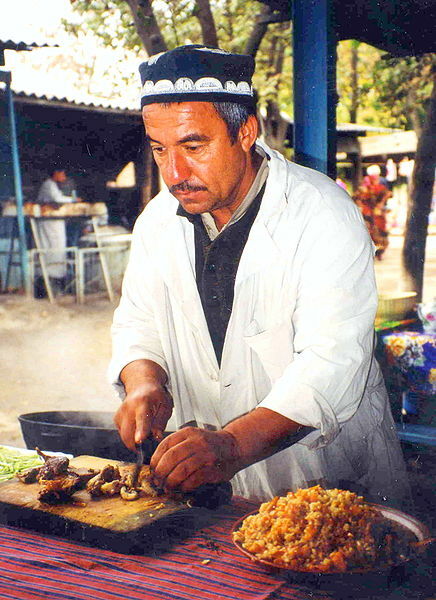 Left: A Tajik man makes plov, the national dish of Tajikistan. Biryani is a Pakistani and Indian dish very similar to pilaf introduced during the Mughal period. It is made from basmati or similar aromatic rice.